I don’t know about you, but I love fried food. My dairy-free lifestyle has significantly decreased my fried food consumption, but I still get crazy cravings for it. 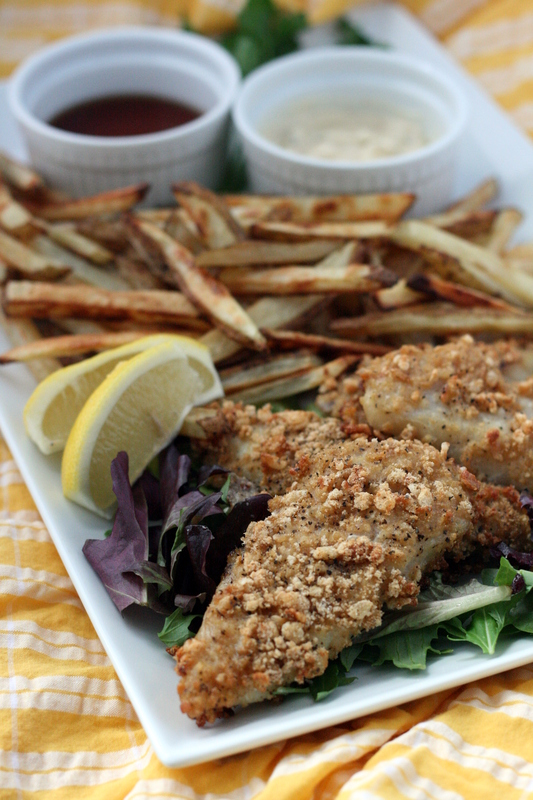 This baked version of fish and chips (or for my fellow Wisconsinites, a good ol’ fish fry) is delicious and completely satisfied my craving for greasy, fried fish and potatoes. Arrange oven racks in upper and lower third of oven and preheat to 450°F. To prepare the chips: Slice potatoes into 1/4-inch thick sticks. Spread potatoes out on in a single layer on a lightly greased baking sheet and spray with olive oil. Place on top rack and bake, flipping fries once or twice, until fries are browned and crisp, about 30 minutes. Remove fries from oven and season with salt and pepper, to taste. While fries are baking, prepare the fish: Coat a baking sheet with cooking spray. Whisk egg whites and a pinch of salt in a shallow bowl until frothy; set aside. Place cereal in a shallow bowl and crush with fingers. Season cereal with salt and pepper, to taste. Dip fish pieces into egg whites, then roll in cereal to coat. Place fish on prepared baking sheet, thin side down and mist with olive oil spray. Place fish onto lower rack and bake until crisp and cooked through, about 12 – 15 minutes. Season fish with salt and pepper, to taste. 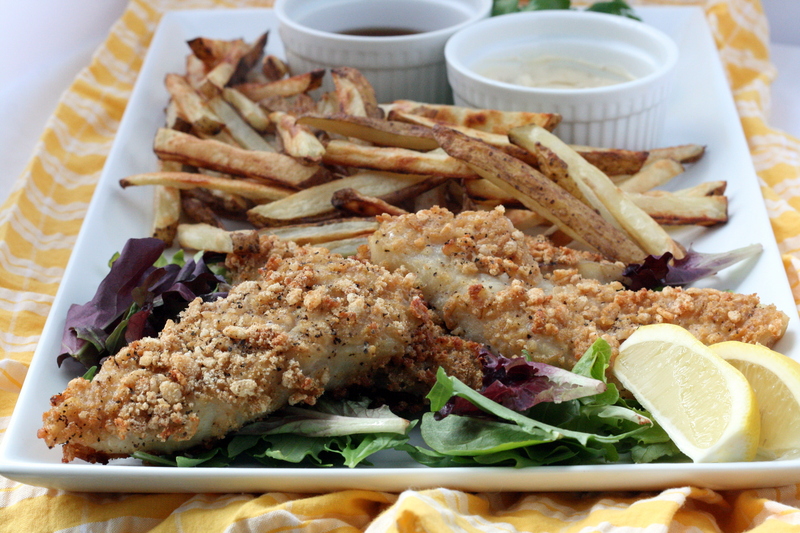 Serve fish and chips immediately with tartar sauce, malt vinegar, and lemon wedges. Categories: Dairy Free, Gluten Free, Main Entrees, Meat, Seafood, Side Dishes, Special Diets | Tags: dairy free, fish, gluten free, main dish, main entree, seafood | Permalink. Prepare the marinade: In the bowl of a food processor, combine 1/2 cup of the coconut milk, jalapeno, garlic, ginger, parsley, lime, and olive oil. Blend until smooth. Season with salt and pepper, to taste. 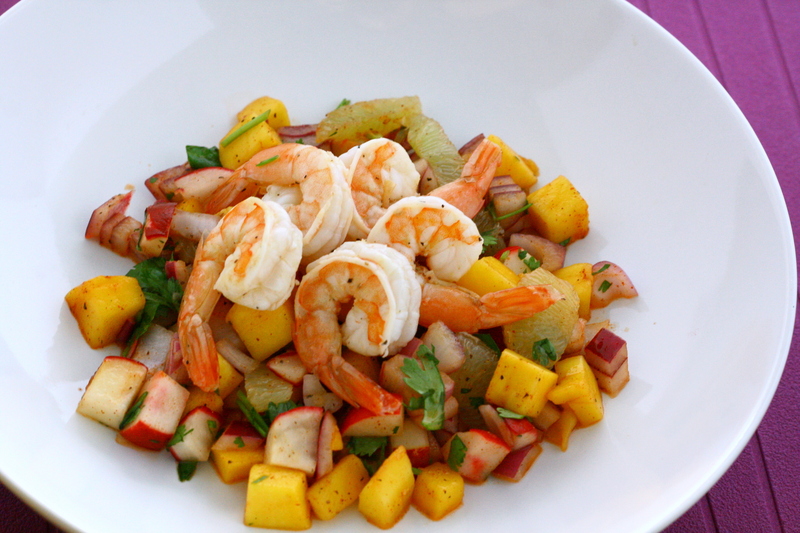 Place shrimp in a small bowl and pour the marinade over it, tossing to coat. Cover and refrigerate for 1 to 2 hours. Rice can be prepared in a rice cooker or medium pot over medium high heat. Combine remaining coconut milk with rice and stir to combine. Cook according to package directions. If using brown rice, add in 1 cup of water. When rice is almost done cooking (white rice will take about 15 – 20 minutes and brown rice about 40 – 45 minutes, in my experience), start cooking the shrimp. Heat a medium skillet over medium high heat. 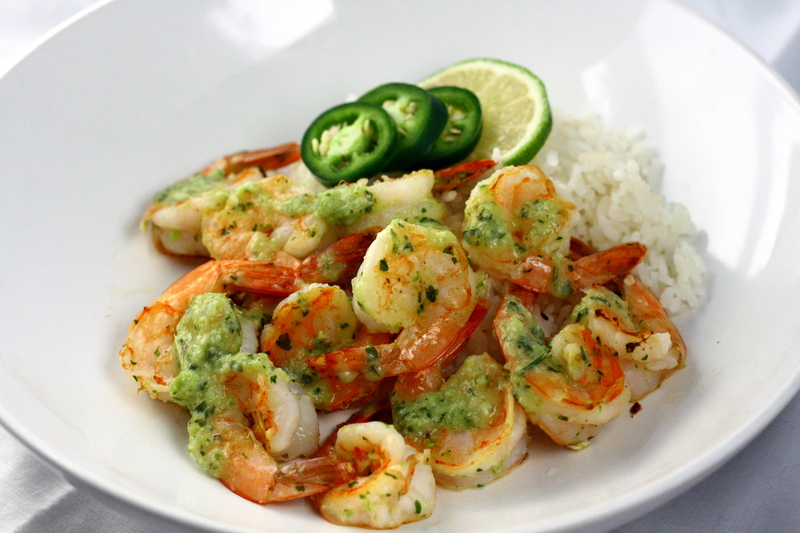 Remove shrimp from the marinade and place in the skillet in a single layer. Cook the shrimp for 2 minutes on one side. 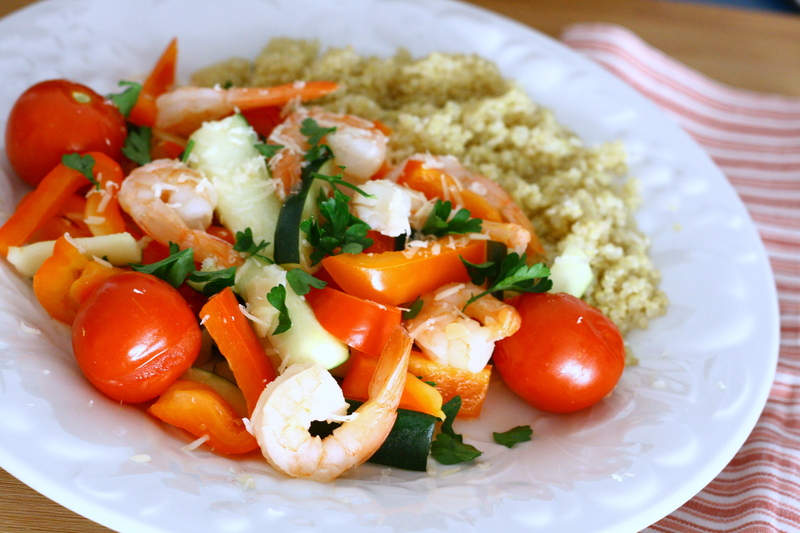 Flip and cook for an additional minute, or until shrimp are fully cooked. 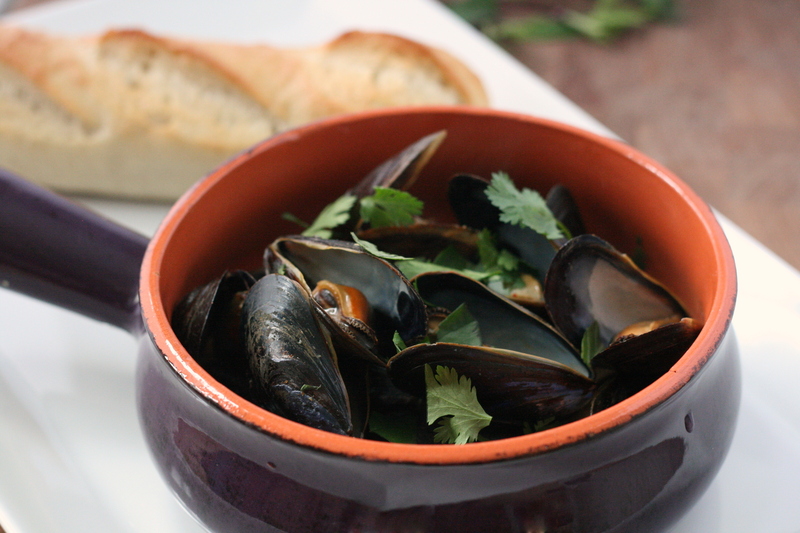 Pour the marinade into small saucepan and bring to a boil. Reduce heat to a simmer and let cook for 3 minutes. 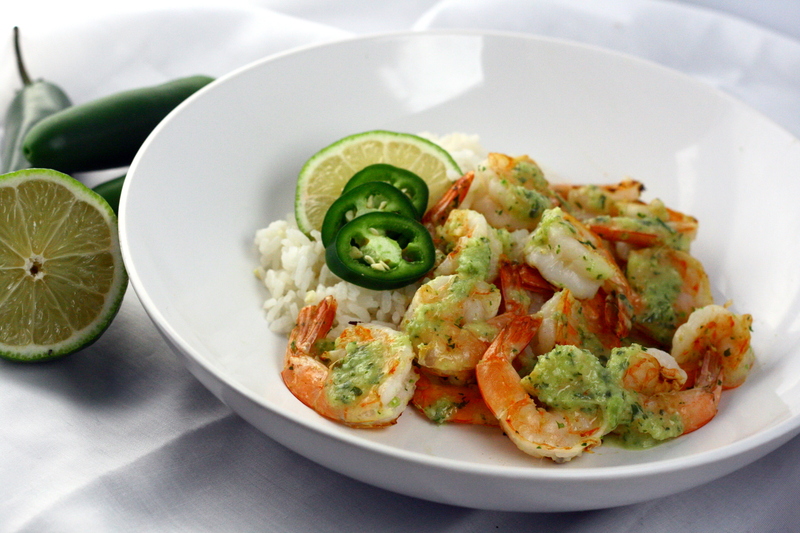 Serve shrimp over prepared rice and drizzle with reduced sauce. Categories: Dairy Free, Gluten Free, Main Entrees, Meat, Seafood, Special Diets | Tags: dairy free, rice, seafood, shrimp | Permalink. I’m happy to say that I survived my first week of work. The best part is that I really, really like my job so far and I think it’s only going to get better! I am also happy to report that we are 90% moved in. Madison is finally starting to feel like home. We have a bed, our laptops, and most importantly – internet. The hardest part of having two homes is not having access to all of my cooking gadgets all the time. I had a difficult time deciding if I wanted to bring my stand mixer or my hand mixer (hand mixer won, due to space), a blender or a food processor (blender… but I think that I might end up getting the food processor anyway), what pots and pans to bring… I’m still not 100% satisfied with my decisions, but that will eventually get figured out, too. The downside to this move is I haven’t been cooking a lot. We’ve been living off of sandwiches, salads, and pasta mixed with ground turkey and the tomato sauce I canned last summer. Nothing too exciting. I do have a shrimp dish that I made pre-move, though! The whole time I was eating this I was thinking about Scott Conant, a judge on Chopped, who hates raw onion. If you haven’t seen him on the show before, you will just have to trust me when I say that this man hates raw onion with a passion. He tears apart every.single.chef that uses it in their dish. If you are like Scott and hate raw onion, this dish probably isn’t for you. If you do like raw onions, then continue on! In a large bowl, whisk together 2 tablespoons olive oil, lemon, salt and pepper. Toss with shrimp until well combined. Cover and place in the refrigerator and let marinate for 45 minutes. Heat remaining olive oil in a large pan over medium-high heat. Cook shrimp until they turn pink, turning once. Remove segments from the limes by cutting off both ends. Place lime on one cut end and with a small, sharp knife, cut off the pith and peel. When all peel and pith is removed, carefully cut between the membrane to remove the lime segments. Place lime segments in a large bowl. squeeze juice from the lime membranes into the bowl. Add remaining ingredients and toss to combine. Place cooked shrimp on top and serve immediately. 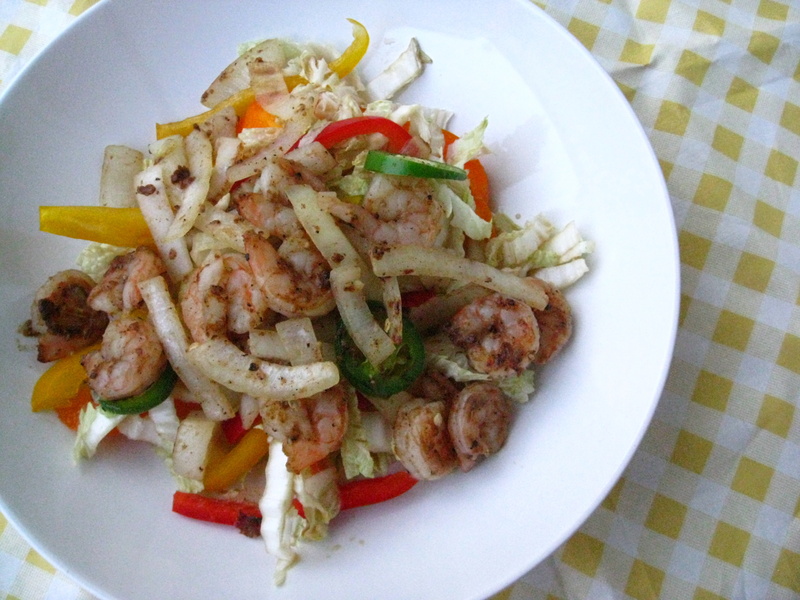 Categories: Dairy Free, Gluten Free, Main Entrees, Meat, Quick & Easy, Seafood | Tags: fruit, main dish, quick and easy, shrimp, vegetables | Permalink. Okay, so I’m a bit of a bad dietitian. I don’t eat fish once a week. Or even once a month, honestly. I can’t really tell you why. I like it, but it just never seems to make it into my menu plan. I almost always have a salmon and tilapia in my freezer, but I very rarely reach for it when I’m putting dinner together. Hmm. Something’s gotta change. To start us off? This delicious salad. This salad isn’t your traditional mostly-lettuce salad. Don’t get me wrong – I love my mostly veggie salads. I eat one for lunch every day during the work week. But sometimes a basic veg salad just doesn’t hit the spot. But this salad most definitely does. 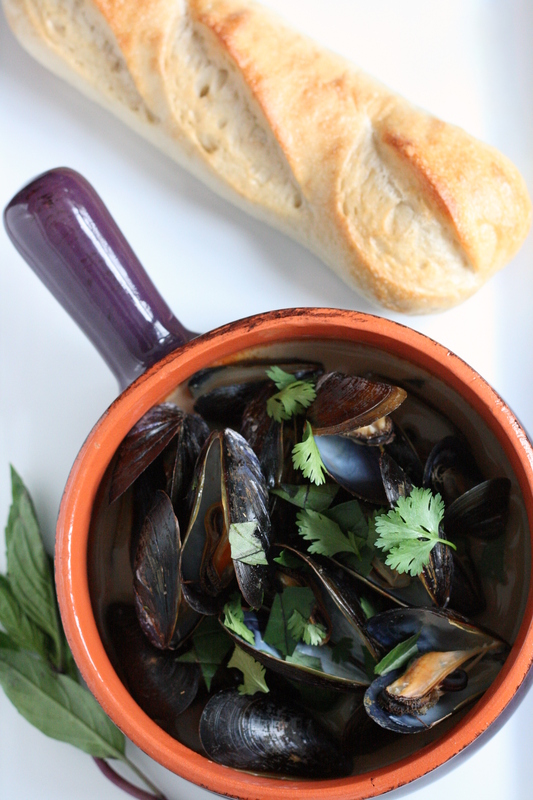 It is chock-full of all sorts of goodies from salmon to artichoke hearts to feta to… well, everything I love. I made this again a couple weeks later and forgot the feta and it still tasted great. Best of all, it was super easy to put together. From start to finish, it only took about 20 minutes. 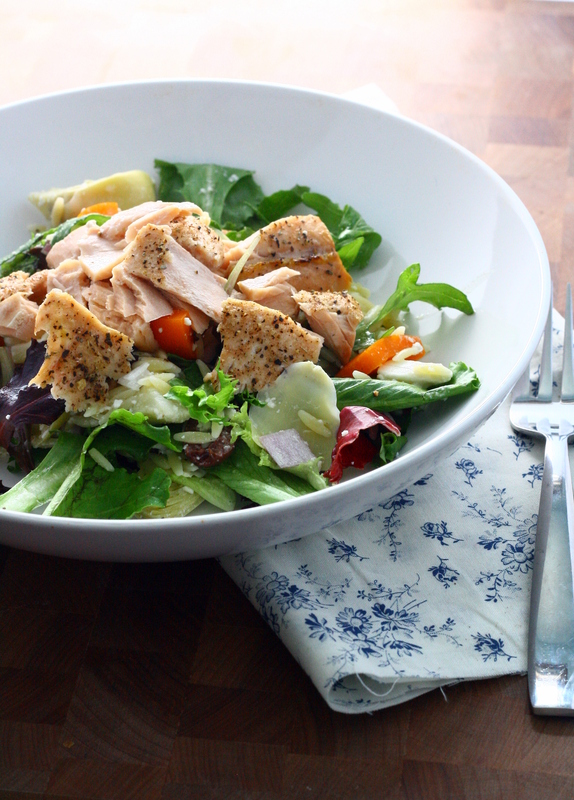 To make the dressing: whisk all ingredients together and set aside. To make the salad: Preheat broiler to high. Sprinkle salmon with salt, pepper, and oregano. Place under broiler and cook for 5 minutes, or until center is cooked. Cook orzo according to package directions. Drain and place into a large bowl. Pour 1/4 cup dressing over pasta and gently toss. Add in olives, bell pepper, red onion, feta, artichoke hearts, and salad mix to orzo and toss to combine. 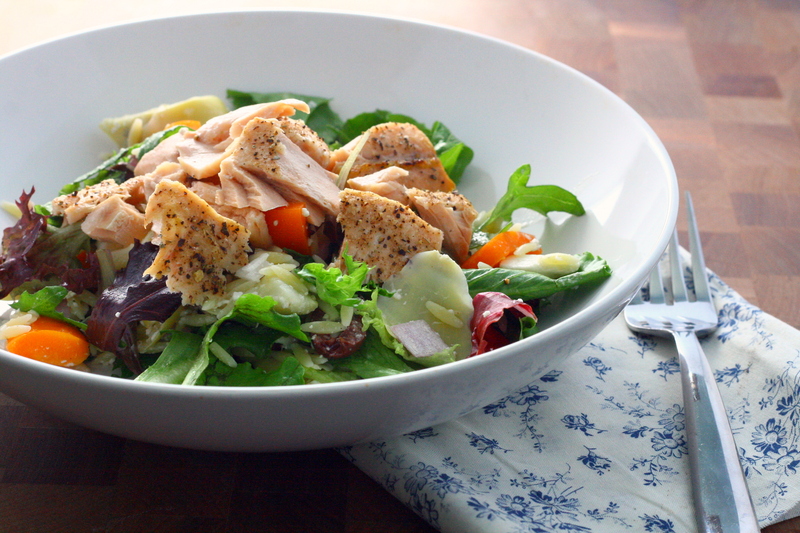 Flake salmon with two forks and place on top of salad. Serve with additional dressing on the side. Categories: Main Entrees, Meat, Quick & Easy, Salad, Seafood | Tags: fish, main dish, quick and easy, salad, seafood, vegetables | Permalink.